Beacon Theatre, also known as the Broadway Theatre and Pythian Lodge, is a historic theatre building located at Hopewell, Virginia. Originally designed by Fred Bishop, who also designed the Byrd Theatre in Richmond, it was built in 1928, and is a three-story, vaudeville and movie theater with storefront commercial space, second-floor apartments and third-floor meeting space. It has Colonial Revival and Art Deco style details. The building features decorative bands of flush brickwork punctuated with rectangular cast-stone corner blocks and cast-stone detailing in the parapet coping; the theater is adorned with classical plaster friezes, an elaborate proscenium, and a cove ceiling in the auditorium. The theater thrived as a movie theater from the 1950s-1970s before being abandoned in 1981 and falling into disrepair. In 2011, the Hopewell City Council took action to refurbish the Beacon Theatre in time for the centennial celebration of Hopewell in 2016. Their goal was to restore the Beacon to its original glory and have it play a major role in the cultural and recreational life of the area. By 2012 the restoration design for the theater and the backstage was complete and renovation began. Work was completed in early 2014 and on Monday, January 13, 2014, the Beacon Theatre reopened to tremendous fanfare with a sold-out concert by the legendary Leon Russell. In the months since the grand-reopening, the Beacon has grown and evolved to meet its directive to play a major role in the cultural and recreational life of the area. It was listed on the National Register of Historic Places in 2000. The Beacon Theatre serves as a performance venue, conference center and special occasion facility. The public is invited to explore each of these aspects of the Beacon Theatre on May 14 from 7PM-9PM.The Beacon’s two (2) beautifully appointed ballrooms will showcase opportunities for the Beacon to serve as a conference center and special occasion facility (weddings, reunions, receptions, socials, conferences, luncheons, corporate events, job fairs, product launches, etc). The theater proper will feature live music from 7-9pm to showcase the intimacy of the venue and its status as a first-rate entertainment/corporate event facility. Hor d’oeuvres and cash bar will be provided. 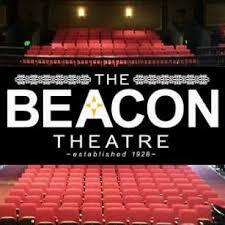 The public may direct questions to the Beacon Theatre box office at (804) 446 3457.